We will start off the day with a visit to Tulum archeological site where a certified bilingual guide will take you to know the mysteries and grandeur of Mayan culture in Tulum, you will also have free time to enjoy by your own this beautiful place! After that, we will go for lunch in Las Cabanas Restaurant, located besides of the archeological site, then we will go to Coba where you can climb the Nochmul Pyramid and visit this ancient city, you will also have a tour guided and free time. The walled city in Mayan language Tulum means "Wall". Tulum has one of the most beautiful beaches in the Caribbean. Step back in time and discover the Tulum Mayan ruins, a place where besides of having one of the most stunning turquoise-blue water oceanfront view, it shares its natural and cultural treasures alongside the second largest Coral Reef in the World. 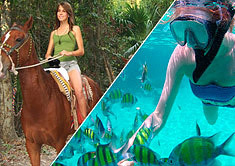 A journey where besides of learn about the Mayan culture, you will have enough time to discover Tulum on your own! So, do not forget to bring your swimsuit! Coba is one of the most important ruin sites of the mayan culture, here you will be able to climb one of the tallest pyramid in the Yucatan Peninsula. Coba means "Water stirred by the wind" because of it's surrounded by two large lagoons, this site is located near the Mayan ruins of Tulum, between dense jungles this place was considered as a place very difficult to penetrate, according with the archeologists in the mid 1800's.